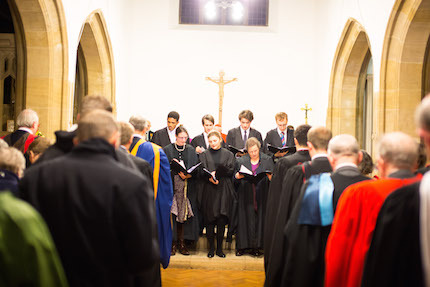 St Edmund’s College Chapel Choir is open to all members of the College community – students, Fellows, staff members, and their families and friends. Members are also welcome from other Cambridge Colleges, and from the wider town community. The Choir rehearses on Tuesday evenings between 6:20 and 7.15pm, and meets at 9.30am before Mass on Sundays. Repertoire includes sung Mass settings and Communion motets and anthems, as well as Latin and English chant. The Choir and Schola also provide the music for special occasions, such as College Feast Days and the annual Carol Service, where a wider range of music is sung. Members of the Choir receive singing lessons from the Director of Chapel Music & Organist, Louisa Denby, and benefit from other musical opportunities both within College and outside. In July 2016 the Choir joined with musicians from St Edmund Hall, Oxford, St Edmund's School, Canterbury, and St Edmund’s College, Ware, for concerts and services in the Abbey of Pontigny, France, the final resting place of St Edmund of Abingdon. The Director of Chapel Music welcomes enquiries from prospective members of the Choir at any stage of the academic year. She can be contacted on lrd23@cam.ac.uk.